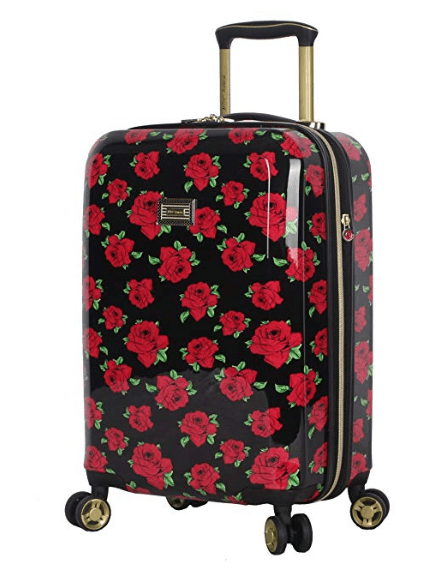 Betsey Johnson 20-inch Hardside Carry-on Luggage has a modern design with a glossy exterior of different patterns, a durable construction and four double spinner wheels. It is not cheap for a cabin bag but appears to be well worth the price tag. You have eight different colors and patterns to choose from: Covered Roses, Skull Party, Lip Service Magenta, Flamingo Strut, Heart to Heart Black, Heart to Heart Purple, Paris Love and Stripe Floral Hummingbird. All of the patterns are offered at the same price on the day of this review. You’ll find the patterns on both the front and rear surfaces of these beautiful looking carry-on bags. Betsey Johnson Carry-on weighs less than 7 pounds and measures 20H x 14W x 9D inches (21.8 x 14 x 9 inches including the handles and the wheels) and will meet the size restrictions by almost all the airlines around the world. It will fit the overhead locker above you on most planes. And the sturdy yet lightweight construction will help you not go over the weight limit. You can gain extra storage space by unzipping through the expansion zipper in the middle. It comes with the eight solid spinner wheels that glide easily and smoothly for you to move and maneuver it even in the tight spaces. The locking telescoping handle has an ergonomic handle for a comfy grip giving you better control over your luggage when you’re trying to catch your flight through a busy airport terminal. It also has another fixed handle at the top with comfortable grip. This is a good looking bag whichever pattern you choose and you’re certainly going to get stares and compliments. And it is not just about the design either, as these bags are made of the very sturdy ABS + PC (composite polycarbonate shell). So your clothes and other stuff will be properly protected when you’re traveling and feel safer when away from home. It will especially be very good at putting up with the abuse by the luggage handlers at the airport. As a proof and backup of its great quality it is offered with a solid warranty of five years by Betsey Johnson, and is shipped quickly within a couple of days via Amazon.com. *The New York designer Betsey Johnson is known for her original and unique designs thanks to her extraordinary vision and talent and the ability to adopt to change. The B. J. Vines has been in business for more than three decades and is still going strong with great products in shoes, jewelry, watches, timepieces, belts, swimwear, handbags and apparel. And they are sold in thousands of specialty stored and department stores.